How to make a locking barn door to divide spaces. So you really want one of these cool and trendy barn doors in your home or office space, but you want to be able to lock it? We have the solution to this problem. Using a Cavilock keyed pocket door lock, you can have a flush mounting lock that will allow the door to slide completely open. It also uses a standard Schlage C keyway so it can be keyed alike the most common key cylinder types. The barn door is made the same as any other application, but you will need to build out a jamb as shown in the picture below for the pocket door lock to connect to when locked. The door in this picture divides two office spaces, but can be locked when desired. Check out the brand new Barn Door Track and Hanger kit from Sure-Loc. A great Quality Kit Starting at $192 per door. You can also order coordinating handles and flush pulls for your own custom barn door look. Tracks come pre-drilled so you’ll need to plan ahead and make sure you have blocking where you plan to mount the track. Or you can mount a solid header piece where the track will go so that the lags keep the track solid on the wall. Occasionally you have a situation where you would like a keyed cylinder deadbolt, but don’t necessarily need a thumb turn on the inside of the lock. A storage closet for instance. For this kind of application, the Falcon D121 is the solution. 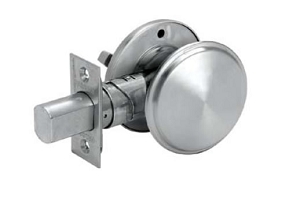 Deadbolt with keyed cylinder outside and blank plate on the inside. NOTE: not for use where people would need emergency egress through the door from the inside. When updating or replacing door hardware in a children’s day care center, it can be a challenge finding the right balance between safety and convenience. Something secure, yet easy to operate is essential. Maybe your Fire Marshall or Building Inspector is requiring a specific kind of lock. 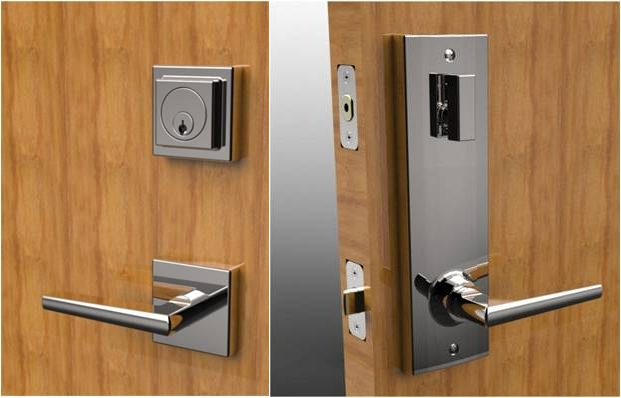 If regulations require locks on all exit doors to release upon turn of the knob or lever, our 5.5 Inch Center-to-Center Interconnected Commercial Locksets are the perfect fit. Also in accordance with most state and local regulations, there is no key or special knowledge/effort required to operate these locks when exiting a building. Even when the door is locked from the outside with a key, or from the inside with a thumbturn, all you need to do is push the lever down or turn the knob to exit the building. 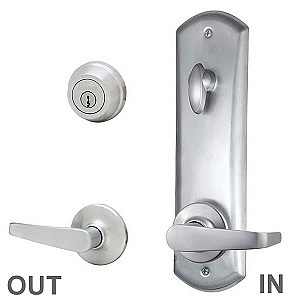 These locksets are equipped with an interconnect device between the knob/lever and the deadbolt, requiring a single action to unlock both simultaneously. Once out of the building, it does not lock behind you making it a quick, easy exit without locking anyone out. Virtually a panic-proof lock for both children and staff. 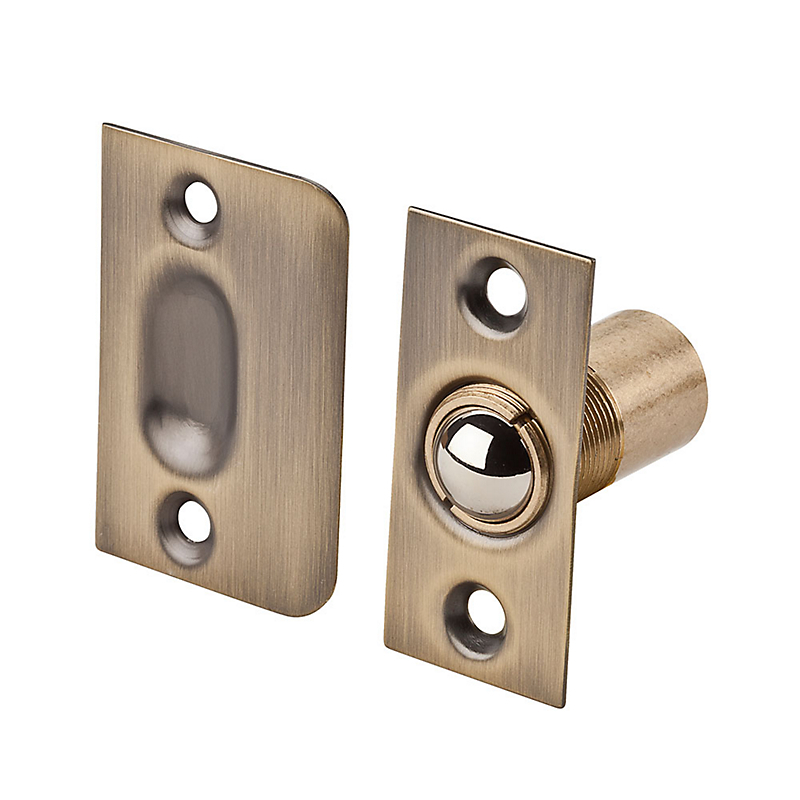 If you are updating or renovatinga children day care center, our 5.5-inch CC Interconnected Locksets such as the locks pictured below, are the ideal hardware replacements. 877-852-9449 Mon-Fri 9-5 Mountain Time, or contact us by email at info@directdoorhardware.com. Are you updating or replacing hardware in an Assisted Living facility? Is your Fire Marshall or Building Inspector requiring a specific kind of lock? 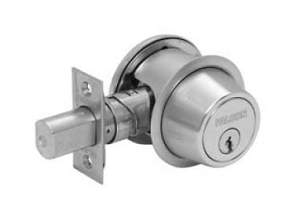 Our 5.5 Inch Center-to-Center Interconnected Commercial Locksets may be just what you are looking for. In accordance with most state and local Assisted Living facility regulations, there is no key or special knowledge/effort required to exit. When the door is locked from the outside with a key, or from the inside with a thumbturn, all you need to do is push the lever down or turn the knob to exit. 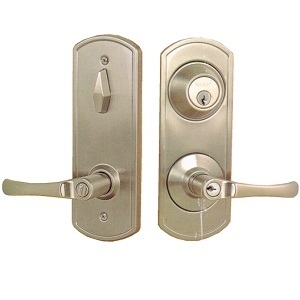 These locksets are equipped with an interconnect device between the knob/lever and the deadbolt, requiring a single action to unlock both simultaneously. Once out of the building, it remains unlocked and will not lock behind you making it the ideal panic-proof lock. Their purpose is to increase efficiency, ease and safety when exiting a building. 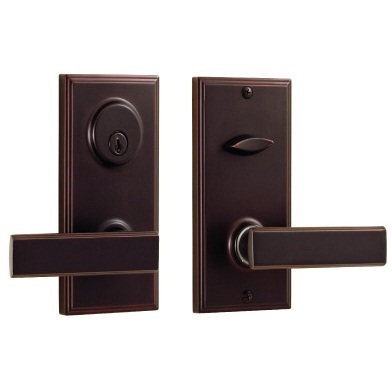 When updating or renovating an Assisted Living facility, our 5.5-inch CC Interconnected Locksets such as the locks pictured below, are the ideal replacements. Cool idea guys, but i think i’ll just keep using my Emtek Emtouch Keyless Lock. Maybe not as fun, but less complicated and no keys required at all. I’m just sure i’d forget to put the key back in the knock knock lock, but I can set my own key code and remember it. Keep being creative though. I wish someone would invent a good public restroom lock that would open without me having to touch the door after I wash my hands. This summer for our family vacation we went to beautiful Lake Tahoe and had a great time with the kids. On one day we went over to tour a cool old castle called Vikingsholm at Emerald Bay which is on the southwest shore of the lake. This place was fun to visit and had some interesting history, and of course I checked out the architecture and cool door hardware there. Vikingsholm was a summer home built in 1929 by Lora Josephine Knight. She bought a big chunk of land at Emerald bay, including Fannette Island, for $250,000. That’s around 3.5 million in today’s money. The home was built out of materials found locally at Lake Tahoe. Granite stones for the foundation and outer walls were quarried on site, and the timber for the structure was cut from that area too. The foundation was laid in 1928 and the rest of the building was completed the following summer. She had hired 200 craftsmen who lived in temporary barracks while they built the home. Vikingsholm was crafted to replicate scandanavian buildings from the 11th century. The workmanship on this place was amazing. Some of the more memorable features are the wood carvings on the structure of the home, paintings on the ceilings and walls and the hand crafted furniture. Some parts of the heavy timber construction were done with tightly fitting joinery with no nails or pegs consistent with the methods used in 11th century Sweden. Check out the door hardware from the main entrance. The handle on the top left draws the latch. The little face on the top of the lock is attached to a pin that drops down in the lock, I couldn’t tell what the function of that was. Keyhole at the bottom to lock or unlock. All of the guest bedrooms had these sweet looking locks imported from Sweden according to our tour guide. The locksets have a latch that can be opened from the inside, but can only be locked from the outside. Apparently the idea on security at the time was that the hostess would lock all of the guests into their rooms at night and then she would lock herself into her own room. Doesnt seem too safe by today’s standards, but I guess there were less problems if everyone was locked into their room for the night. All of the doors had the cool old strap hinges on them. These hinges, along with the fireplace screens and metal light fixtures were forged by hand on site. Vikingsholm was an amazing place. Much to be admired there as it was built in the early 1900’s by skilled craftsmen. The detail on this place was unbelievable. Today Vikingsholm is owned by the State of California, its been very well preserved and is a fun place to visit. Also plan on a short hike to Eagle Falls and playing at the sandy beach, or rent a kayak right there at Emerald Bay.